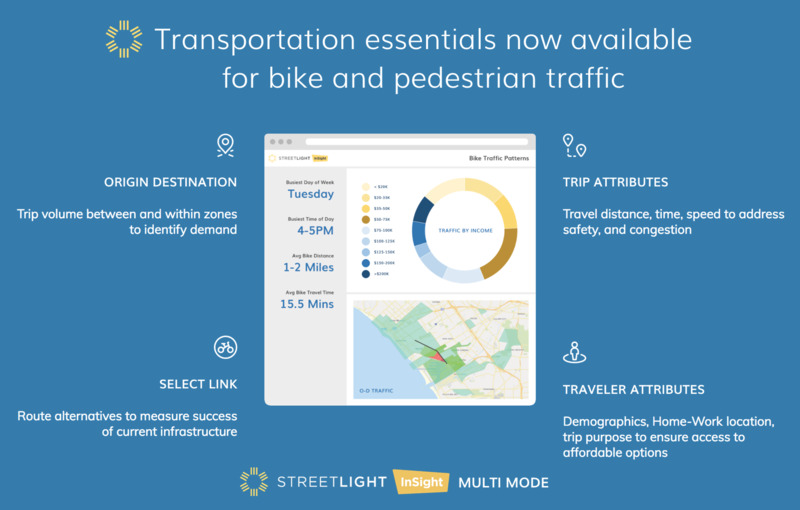 "Our industry has been in the dark for years on bike and pedestrian movement because of the cost and difficulty of data collection," said StreetLight Data CEO Laura Schewel in a statement. "Now we can shed light on these mobility trends, giving planners the ability to make smart decisions about policy and infrastructure investment." As cities continue to invest in active transportation, it’s still a challenge to know just how many bikers and pedestrians are using streets. Departments have resorted to brute force methods like hand counting, or with more low-tech sensors like beams or sensing strips on streets. The result is a lack of high-quality data on just how many people are using active transportation, when peak times are and where non-vehicle traffic is going. A better census could help direct new investments (increasing bike infrastructure at a particularly busy intersection, for example) and is likely to help with safety. And as cities try to build out bike-share networks, an idea of where people are riding can help ensure that new equipment is used and is targeted to the right neighborhoods. In a statement, Schewel said she hoped that by better measuring all forms of mobility, "we can manage towards a future where these modes of travel are more prevalent." StreetLight Data has been picking up clients as cities look to get a better handle on using analytics to guide budget and policy decisions around mobility. This summer, the firm announced a $10 million funding round that it said would help it expand geographically and track other streams of data, including vehicle emissions and the impact of autonomous vehicles. The company’s analytics methods have been used by cities like Toronto, San Diego, and Lafayette, CA for projects including congestion management and analyzing the impact of tollways; bringing multimodal analytics to the mix will help cities explore a wider scope of projects.